Here is a real simple DIY microphone boom for about $20 (2003 dollars). 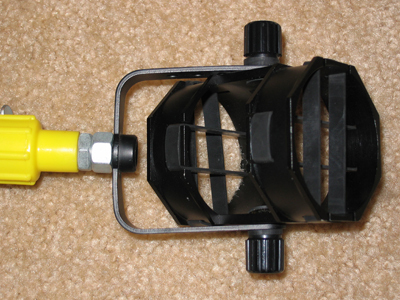 The shock mount is not included in this price, and runs about $50 (2003 dollars). 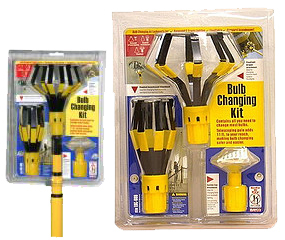 Mine is built using a collapsible light bulb changer kit by Bayco, as shown below. However, I have seen something similar for fishing that can be utilized. For my design, you'll also need a 3/8"-16 1-1/2" long bolt and two 3/8"-16 nuts (I have one nut thinner than the other, explained below). You'll also need a screwdriver and a drill, reamer or knife. The collapsible pole locks into position and extends up to about 11 feet, but can collapse to about 4 feet. With your new hole, put the bolt in so the bolt head is inside the attachment, the bolt shaft sticks out. Lock it in with a nut or two. (I use two nuts just because when I used one the bolt shaft stuck too far up into the shock mount, limiting the shock mount's range of adjustability, one nut being thinner than the other to use up just the right amout of space on the bolt shaft.) It will look like the picture below. 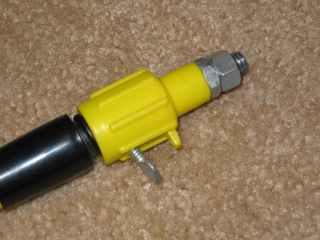 The thumbscrew that sticks out of the attachment head is simply to keep the attachment head onto the pole. Next, attach the shock mount and that's it. I use the Audio-Technica AT8415 shock mount. It comes with an adapter that allows for either the 3/8" bolt or another larger size, but in this design, that adapter is not used. Mounted on, here's the final product. When you put your microphone into the shock mount, you then have the XLR or microphone cable to deal with. I just wrap it around and then tape it on using gaffer tape. The picture below shows my boom in use on one of my short films.